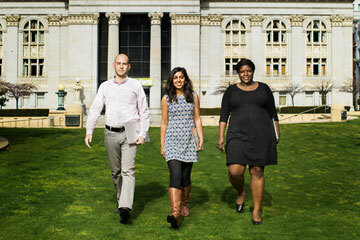 From left, Cris Cristina, Richa Agarwal and Sheila Dugan are fellows at Oakland's city hall. The Gumbo is great, and the nightlife is even better, but let's face it: no one is ever going to mistake New Orleans for a tech hub. But that's exactly why Amir Reavis-Bey knew he could make a difference in the Crescent City. In 2012, Reavis-Bey left a well-paying job as an investment-banking technologist in New York City to join Code for America, a fledgling nonprofit group that puts civic-minded techies to work in city governments around the country. He felt some culture shock at first--the tech infrastructure "was very different than in New York, to say the least," he notes--but before long, Reavis-Bey and his three fellow team members figured out how to use their digital know-how to make a mark on New Orleans. After a monthlong survey of residents and officials, they focused on the problem of urban blight: the damaged and abandoned properties that afflict large portions of New Orleans. Over their year of service, the Code for America fellows built BlightStatus, an app that uses city data to allow residents to instantly find out the status of properties in their neighborhoods and helps officials keep on top of the spread of blight. "We were able to solve a problem that citizens brought to us," says Reavis-Bey. "This was a huge chance to make an impact." That kind of impact--using digital tools to make a real-world difference--is exactly why Jennifer Pahlka founded Code for America several years ago. After nearly a decade of organizing Web- and game-development conferences, Pahlka was searching for her next project in 2009 when she had a conversation with Andrew Greenhill, then the chief of staff for the mayor's office in Tucson, Ariz. The tech world's focus had turned to Washington--it was energized by Barack Obama's innovative campaign--but Greenhill told Pahlka it was local governments that really needed help. Municipalities sit on vast amounts of data--think of all the paperwork an urban bureaucracy can create--but lacked the technical expertise and the money to make it accessible and usable. Meanwhile, smartphone-enabled citizens were increasingly expecting city services to be delivered by the Web. "It was a moment where you could see what the principles and the values of the Web could offer government," Pahlka says. Code for America brings those values and skills to government service. Programs like Teach for America and the Peace Corps recruit smart college graduates into education and economic-development work, but there were few ways to channel young people with a tech background into public service--even though digital skills are becoming more and more important at every level of government. Pahlka wanted to build a similar model for tech but wasn't sure if it would work. With Silicon Valley companies throwing money and perks at the best engineers, would techies be willing to take a year off from the private sector to work at not much above minimum wage? (Code for America fellows receive a $35,000 stipend.) "I was very worried that it would be a tough sell," she says.